Realism contends that conflict is intrinsically linked to natural resource endowment. This is the basis upon which the 'resource curse' theory is premised. Idealists on their part however view natural resource endowment as an avenue for economic growth and improved social and economic welfare of resource-rich communities. Their strong belief in the progressive potential of natural resources underpins the 'rentier state' theory. Soon after the discovery of a 'world class' oil deposit in Amuru district in northern Uganda, the 'black gold' discovery has quickly proved its unpleasant consequences on the already war-affected population, just emerging from a two decade human instigated crisis into the recovery mode. Widespread land disputes, environmental damage, illegal land acquisition, population displacement, suspicion over oil deal manoeuvring and other undesired consequences of oil activities are already posing a real threat to the capabilities, the assets base, resilience and copying mechanism essential for livelihood in Amuru. Sooner or later this ever lingering question will be answered: "Is the discovery oiling conflict or development in Amuru?" It is becoming apparent that the discovery more likely portends doom than it heralds prosperity for host communities in Amuru. This research juxtaposes the two resource conflict theories: the 'resource curse' and 'rentier state' against the socio-economic realities in Amuru as a basis for understanding the context of the new conflict landscape in the district. 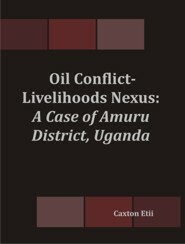 The study unravels a close relationship between oil conflict and livelihood in Amuru district therefore backing up the long held general view that oil-rich countries especially in the developing world have been plagued by conflicts, abject poverty, environmental degradation and bad governance contrary to expectations that oil would propel these economies to growth and sustainable development. Based on analysis of the findings, the research recommends practical measures to transform the violent process of resource acquisition by local and foreign agents towards a free multilateral cooperative enterprise, a win-win arrangement that will benefit all stakeholders and create an environment conducive for local, national and regional as well as international peace and prosperity.